Walt & Nancy & Sophie's Westerly 22 "Ariel"
I'm sending you four pictures of Ariel you may post whatever you think would be appropriate. We have had the boat for about 2 years and have really enjoyed it. Have cruised mostly Lake Pepin in Minnesota however this winter the boat is in Lake Travis, Austin Texas for the winter and am planning to spent 2 months on her in January and February. Next spring the boat will be moved to explore the Apostle Islands and maybe some of upper Lake Michigan. 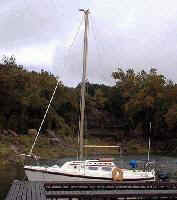 The first picture is Ariel at her winter dock on Lake Travis. 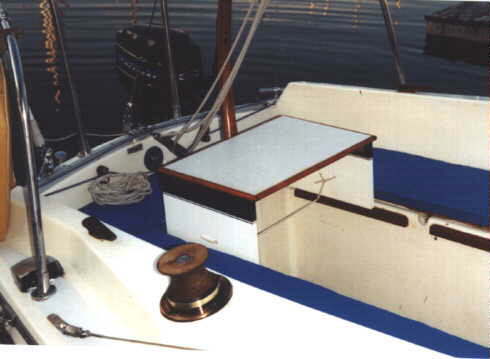 Note the additional teak eyebrows and hand rails. On the masthead is a colormaster TV antenna from our local fleet farm store works really well in close reception areas great local weather reports. Also added a Nicro power vent to the forward hatch. The BBQ is a magna 16" and turns out great steaks. All the teak got stripped last year and put on 4 coats of Cetol still looks good after 6 mo. in the Minnesota sun. This boat loves heavy weather and sails best at windspeed of 15 to 26 mph. Put a reef in about 18mph and this is one happy little boat. We use a auxiliary 9.8 Mercury on the boat and have a 5.0 Mercury on the 9.4 Zodiac dingy which we usually pull up on the back rail with the motor in the water. The shot at left is looking aft from the vee berth. We took the area used as a hanging locker and added a mahogany bookcase and drawer unit, it screws in from the galley side so can be removed if nessassary. Below it a two doors that are seperate storage areas. 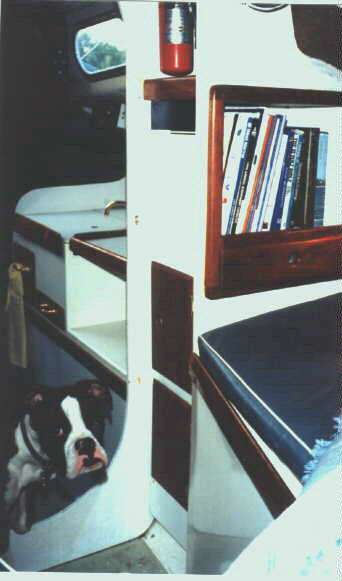 (Gally storage currently) The puppy is Sophie our boxer and constant companion really loves her dingy trips. The shot at right is a picture of a small cockpit table I built it rides on mahogany rails that run the length of the cockpit. 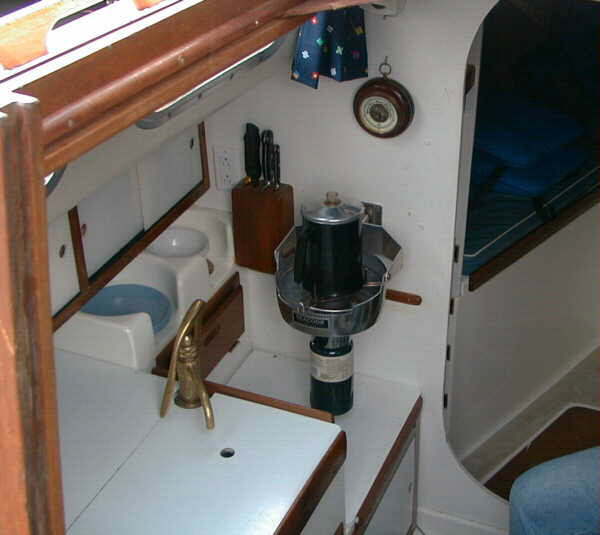 It folds up when not in use and will fit down on the rails and with the table from inside the boat to form a sleeping area. 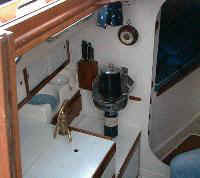 We have done other projects to the boat and would be happy to share them. 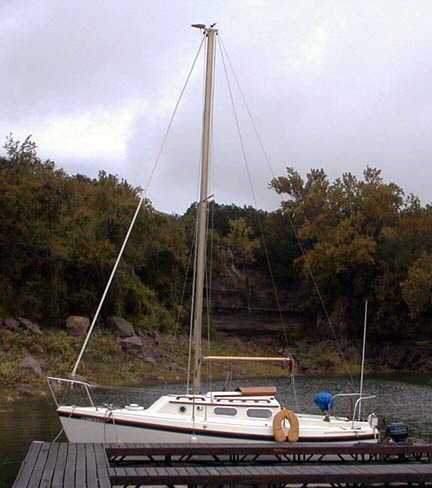 I really like this boat it suits our current needs and is easily handled by Nancy and me.